Joseph Young leads Oregon into an early season test in the Legends Classic on Monday and Tuesday. Which bubble teams have chances to prove themselves in early season tournaments? Oregon, BYU, Arizona State and Purdue lead the candidates. 1. The regular season is meaningless. 2. It’s too early to talk about the bubble. If you’re a bracket nerd -- and I know you are -- then you understand the degree to which early season tournaments can determine who makes the field of 68. These events are crucial because they give potential bubble teams an opportunity to play quality competition at neutral sites. The results that occur this week will be mentioned often come late February and early March. The question is, which teams will gobble up their opportunity? To search for the answer, I’ve basted, baked and carved up the fields of 10 Thanksgiving week tournaments and identified the one potential bubble team with the most to gain -- and lose. That’s right, Hoopheads, it’s time to talk turkey. The Sun Devils play Maryland in tonight’s semifinal. Iowa State and Alabama play in the other semifinal. If you look at the Pac-12, you’ve got to figure that Arizona, UCLA and Utah will be NCAA tournament teams. It’s not going to be easy for ASU to fight into the conference's second tier, so the Sun Devils need to get as much work done before January as they can. Consider also that Maryland is going to be a middle-to-bottom team in the Big Ten, so a loss to the Terps on a neutral floor is not going to look good in March for Arizona State. And should the Sun Devils beat Maryland and face Iowa State, that’s a classic RPI win-win. Even if Arizona State loses, its strength of schedule rank will be bolstered. After missing out on the NCAA tournament the last two years, Matt Painter is trying to rebuild with a nucleus that features two freshmen forwards plus sophomore sharp-shooter Kendall Stephens. I like the youngsters, but if the Boilermakers are going to get quality wins in Maui, they are going to need their veteran center, 7-foot junior A.J. Hammons, to be more assertive. Purdue could really turn some heads if it beats a very good Kansas State team in the quarterfinal. That would land it a house-money date with Arizona. Even if the Boilermakers lose to Kansas State, they will have some opportunities in the consolation bracket against the likes of Pitt, BYU or San Diego State. However, if they go home with one or zero wins, then a third consecutive missed NCAA tourney will likely be in their future. Boiler up! Three members of this four-team field are NCAA tournament-bound: Michigan, Villanova and VCU. That means Oregon has the most to gain. Dana Altman’s program has been depleted by off-court troubles, but he still has one of the nation’s most talented wings in Joseph Young, a 6-foot-2 senior who has averaged 26 points in the Ducks’ three opening wins. Oregon's semifinal opponent, Michigan, also has an excellent group on the perimeter, but the Wolverines are thin and inexperienced up front, so they could be primed for an upset. If the Ducks lose their first game, they will have another chance to boost their RPI against the loser of the Villanova-VCU semifinal. ), but it is possible that none of those opponents will make the NCAA tournament. So the Cowboys can't afford to have any bad loses heading into conference play. Talk about a mouth-watering opportunity. Georgetown’s quarterfinal opponent is Florida, but the Gators are missing two injured starters, and two of their top sophomores (guard Kasey Hill and forward Chris Walker) are playing poorly. That’s why they lost to Miami in Gainesville and needed overtime to get by Louisiana-Monroe at home last Friday. Not only would a win over Florida boost the Hoyas' RPI, but it would probably earn them another great RPI opponent in Wisconsin. On the other hand, if Georgetown loses to Florida, it will slide to the consolation bracket and probably play UAB in its next game. The Johnnies are one of three potential bubble teams who will join Gonzaga at Madison Square Garden this week. So they need to take advantage of the home cooking. Even if St. John’s loses the semifinal to Minnesota, it will have another good opportunity for a bubble win in the third-place game, probably against Georgia. Keep in mind the Red Storm also play a winnable true road game at Syracuse on Dec. 6. I know this team underachieved last season, but I love the veteran backcourt of D’Angelo Harrison and Rysheed Jordan. Even so, if St. John's comes out of MSG with an 0-2 record, its path to the NCAA tournament will be quite a bit steeper. We all know this is an important year for Yellow Jackets head coach Brian Gregory, and it got off to a terrific start with an 80-73 win at home over cross-state rival Georgia. His team has a great chance to build on that momentum. Its quarterfinal opponent is Marquette, which lost at home on Saturday to Omaha. If the Jackets advance to the semifinal, they will probably play Michigan State -- which would be interesting considering this is not a vintage Spartans team, and Gregory is a former Tom Izzo assistant. If Georgia Tech can somehow pull off those two wins, that would serve up an RPI win-win game against Kansas. I like the Yellow Jackets’ frontcourt tandem of 6-9 sophomore Quinton Stephens and Maryland transfer Charles Mitchell, a 6-8 junior, but they are going to need everybody’s best effort this week. This is not a great field, but it does have three potential bubble teams in UTEP, Washington and Xavier. I’ve been ranking the Miners in my top 25, so I obviously think they are the best of the bunch, although they were fortunate to escape New Mexico State by one point at home last Saturday night. UTEP returns four starters from a squad that won 23 games, and it has a next-level prospect in 6-8 sophomore forward Vince Hunter. If the Miners leave Anaheim 3-0, they’ll have bought themselves some equity should they fail to get Conference USA’s automatic bid. Memphis and Baylor are also potential bubble teams, but they have been regular NCAA tournament participants in recent years. The same can't be said for the Illini, which did not qualify last season and has been left out in three of the last five years. Is this team good enough to get there? Head coach John Groce is hoping his two transfers, 5-9 senior guard Ahmad Starks (Oregon State) and 6-3 junior Aaron Cosby (Seton Hall), will provide the right answer. Illinois’ semifinal game against Indiana State is a must win. The Illini can still build a tourney-worthy resume even if they lose to Baylor or Memphis in the final, but every little bite ... er, bit helps. Creighton is also a semifinalist, but the Bluejays already got a hang-your-hat win last week when they defeated Oklahoma at home. The Bearcats, meanwhile, have a tough stretch coming up with road games at Nebraska and N.C. State as well as home dates with San Diego State and VCU. Cincinnati needed 24 points off the bench from junior college transfer Farad Cobb to beat Morehead State at home by eight points last Wednesday. The Bearcats' first opponent in this event is Middle Tennessee, so they clearly need to win that one. If they do, they'll get Creighton or Ole Miss in the final. RPI-wise, those are not great games for Cincinnati. A loss will hurt it more than a win will help. But when you’re a team that is potentially headed for the bubble, you need all the help you can get. • You all know about Wyoming's Larry Nance Jr., right? Just checking. Chip off the old block. • I was not the least bit surprised that Rhode Island guard E.C. Matthews erupted for 26 points in the Rams’ win over Nebraska on Saturday. He looked terrific when I saw him in summer workouts against college players at the Adidas Nations camp this summer. Matthews got 11 of those points from the foul line and also grabbed 10 rebounds. Not a bad night’s work. • That, by the way, is why Power Five schools don’t like to play true road games against midmajors. Not sure what Cornhuskers coach Tim Miles was thinking with that one. • Trivia question: Which Division I coach currently has the most number of former assistants working as head coaches? The answer is below, and it will surprise you. •​ Kind of a shame what has happened to the Great Alaska Shootout. That used to be one of the premier events of Thanksgiving week, and I was going to include it in my list of tournaments above. But the field was so weak -- Washington State is the only one of the eight schools from a power five conference -- that I decided against it. •​ I sure hope SMU gets Markus Kennedy back for second semester. The 6-9 junior forward is the Mustangs' best post player, but he is academically ineligible. The team, which is off to a 2-2 start, really misses him. •​ Allow me to add myself to the chorus of voices objecting to the possibility that the NCAA’s basketball committee will copy what college football’s playoff committee is doing by releasing its top 16 seeds (four in each region) every week. The NCAA tournament does not need gimmickry to get people’s attention. We love the suspense of not knowing what’s coming out until 6 p.m. on Selection Sunday. If Dan Gavitt, the NCAA's vice president of men's basketball championships, was trying to float a trial balloon by mentioning this idea to Nicole Auerbach of USA Today, I hope we can consider it popped. •​ I love that John Calipari started 6-foot sophomore guard Dominique Hawkins in Kentucky’s game against Boston University last Friday. Hawkins is usually the 11th man in this rotation, but Calipari found a way to make the young man feel good. If the Wildcats ever need Hawkins to come through in a tight spot, which is likely, that confidence could pay off. • I also love that junior small forward J.P. Tokoto is leading North Carolina in assists. •​ Damontis Sabonis is filthy. Pass it on. • So let me get this straight. Two weeks ago, Tom Crean was about to get canned. Now, his Indiana team wins a couple of decent games in November, and nobody is saying bupkus? Strange times, these. •​ Besides being a great player, Stanford senior guard Chasson Randle also managed to earn his undergraduate degree in three years and is currently pursuing his Masters in psychology. I had the chance to speak about with him last week in Brooklyn. Wherever this young man is headed after this season, I’d recommend buying stock in him. • Real rough start for Florida State. A three-point loss at home to Northeastern last Tuesday was followed by a pair of losses in Springfield, Mass. over the weekend: by 26 points to Providence and by six points to UMass. The Seminoles are now 1-3. To say the least, that does not bode well for ACC season. • I realize Malcolm Brogdon gets most of the attention at Virginia, but so far Justin Anderson has been the Cavs’ best player. I love big guards who can make threes and rebound. • Spent some time with former UConn coach Jim Calhoun in Indianapolis last week, and he told me he thought that Daniel Hamilton was the Huskies' most talented player. It also sounds like Calhoun is still keeping the door open just a crack for a possible return to coaching, although I think that’s one of those ideas that sounds good until it’s time to actually do it. • I also spent some quiet time with Mike Krzyzewski following Duke’s win over Stanford Saturday night at the Barclays Center in Brooklyn. (See my Q&A with him below.) The guy was so wired and amped while talking about all the ways his team can get better, he could barely sit still -- and this is after coaching five games in nine days. There has been a lot of speculation about when Coach K will hang it up (he turns 68 in February), but he doesn’t strike me as being anywhere near retirement. He will pass 1,000 career wins this season, and I’d guess he will continue to add to that total for several more years. • Don’t you just love that senior forward Jonathan Holmes, not freshman Myles Turner, has been by far Texas’ best player? •​ I’m sure I’m not alone when I say I am really rooting hard for Cal to have a good season. It would be great for Tennessee fans to see how dumb it was to run Cuonzo Martin out of town. • By the way, it’s pronounced KON-zo, not KWAN-zo. Also, it’s Gon-ZAG-guh, not Gon-ZAH-guy. Please make a note of it. •​ I’ve never understood why the NCAA has a rule limiting summer foreign tours to once every four years. If a school wants to send its team to another country for a couple of weeks every year, why shouldn’t it be able to? It’s a great cultural experience, and the kids get to play more games together. • Betcha a nickel that Syracuse freshman forward Chris McCullough is one-and-done. • Speaking of which, I’ve never understood how people can complain that the one-and-done rule is bad for college basketball. Are we forgetting that before that was put in place, the rule was none-and-done? The NBA’s draft minimum has been huge boon for this sport. Huge. As usual, we spend 90 percent of our time talking about a rule that affects less than one percent of players. • Man, Iowa’s guards just can't score. • I know it’s early, but Utah’s Delon Wright is off to a shaky start. His scoring average (11.0) and field goal percentage (.414) are significantly down from last year (15.0 and .561, respectively). He went 2-for-13 from the floor in the Utes’ loss at San Diego State last Tuesday. It’s a lot different coming into a season with some buzz, but then again, the Aztecs are going to do that to a lot of good offensive players this season. •​ Although I really don’t know about SDSU’s point guard situation. • And it’s nice that San Diego State gave Steve Fisher a contract extension, but that is meaningless as far as I’m concerned. Fisher is going to turn 70 in March, and I think there’s a very good chance this is his final season. Just an educated hunch. • Sure hope Danny Manning knows what he has gotten himself into at Wake Forest. There’s a reason not many people wanted that job. •​ Tough blow for Pittsburgh to lose Durand Johnson. The 6-6 junior guard was supposed to be the Panthers’ best outside threat, but Jamie Dixon announced recently that he has been suspended for the entire season. Pitt has been playing some very soft defense in the early going, which is why it lost to Hawaii on Friday night. So Dixon and his guys have a lot of work to do. •​ I love it that coaches still talk about watching “tape” of games. Is that VHS or Beta? •​ I watched Michigan practice when I was in Ann Arbor last week, and let me tell you, John Beilein has himself quite a find in Duncan Robinson. The 6-8 sophomore forward transferred from Williams College, a Division III school which Robinson led to the national championship game last year. It was only one practice, but Robinson has a beautiful stroke. He looks like a classic stretch four in Beilein’s offense. Think Kevin Pittsnogle without the tatts. •​ I guess this year’s freshman class is not quite as hyped as last year’s – which is good because it means that every college basketball story doesn’t begin with speculation on where these guys will get drafted. Maybe we’ll actually get to watch them play in college for a few months before figuring all that out. •​ We all know VCU guard Briante Weber is a defensive genius (he’ll probably become the NCAA's steals king this season), but I’m impressed with how he has rounded out his offensive game. I’m still concerned, however, about his team’s lack of size. •​ Just once, when a college athlete is asked what he does in his spare time, I’d love to hear him say he reads book instead of that he plays video games. •​ The Big 12 is the only power five conference that still plays a double round-robin. Just making sure you knew. • I saw a quote Oklahoma State athletic director Mike Holder gave about the enormous buyout in Travis Ford’s contract last spring. Holder said, “In retrospect, [the contract] wasn’t good for him or us.” Uh, Mike, that contract made it way too expensive for you to fire Ford. How in the world is that bad for him? •​ Gonna be interesting watching Thad Matta play a lot of zone this season at Ohio State. This is where college hoops is going. •​ I see that Georgetown forward Mikael Hopkins is using the hook shot. I truly do not understand why more big men don’t learn it. That includes the NBA. It is unblockable. •​ If you ever hear anyone honestly arguing that a college team can beat an NBA one under any circumstances, just know for the rest of your life that that person should not be taken seriously. Child, please. •​ One of the worst recent trends in college athletics is the building of fancy dorms for athletes. These athletes should live in regular dorms with regular students. It would make their college experience so much more enriching. •​ It’s pretty amazing that Oliver Purnell has coached for 26 years at five different schools, and yet he has never won a single game in the NCAA tournament. Not one. That is not easy to do. •​ Smart move by the basketball committee to go back to calling the Rounds of 64 and 32 first round and second round. That was classic overthinking. However, I was really disappointed that New Orleans got shut out of the future Final Four sites. Just a bad, bad move. Now how am I gonna get another oyster po boy at Mother’s? SI.com: How was your energy level when you came off coaching in the World Championships for USA Basketball? SI.com: For a guy who is a few months from turning 68, you have a lot of energy. How many hours of sleep do you get a night on average? Krzyzewski: I get about five or six, I’d say. But on the road, I sleep. I went to bed at five this morning because we were studying [to prepare to play Stanford], but I still got four hours. Then this afternoon, I got three hours. I always sleep on game days. SI.com: You’ve coached LeBron James at USA Basketball, and you coached Kyrie Irving for one season at Duke. How do you think their arrangement in Cleveland is working out so far? knows this. You have to let all those people contribute and then it becomes everybody’s team, but it takes time. Meanwhile, everybody’s gunning for them. SI.com: You’ve said in the past you’d like to see more “basketball people” on the NCAA’s selection committee. Do you like the way the football committee is doing that, where they are basing so much on scoring margins and the eye test? In basketball, a win by one point counts the same as a win by 20. Krzyzewski: Yeah, and that’s wrong. It’s not just numbers. Football has gotten a lot of people who know football, and we should do the same with basketball. That’s nothing against the committee. The committee tries as hard as they can to learn as much as they can in a short period of time, but they’re not experts in the game of basketball. Even if you just had an advisory group, where you have someone like Bob Knight or John Thompson say, “You know, you should think about that a little bit differently.” Our tournament craves for that. SI.com: I’m a huge Bruce Springsteen fan. When he came to your game at Madison Square Garden last year, you mentioned that you had seen him in concert. Frankly, I have a hard time picturing you at a Springsteen show. Krzyzewski: Just one. We saw him in Vegas. I loved it because of his energy. I love performances. My wife and I love Broadway shows. I love to see people who put it on the line and it’s live. That’s why I love sports. I love people who perform. SI.com: So what’s on your iPod? Do you even have one? Krzyzewski: I don’t. I just listen to my wife’s iPod, or my daughters’. If I listen, I’m listening more to Motown, but I listen to current music. I always like to be in control of my environment. I don’t want to be singing while I’m walking. SI.com: You’ve said in the past that you were considering going on Twitter. Now that Jim Boeheim is doing it, are you next? Krzyzewski: I’m not going to get on Twitter. I follow people on Twitter, but I don’t see me doing it. Part of it is, I don’t want people have access to me, except my family or Duke people. If I’m going to sell something, I’ll sell it some other way. SI.com: Do you follow Boeheim? Krzyzewski: My wife does. He’s very boring. SI.com: Tom Izzo often says he thinks social media is awful. He hates it. Do you? Krzyzewski: I think social media is great. I’m concerned about my grandkids doing it, but I’m concerned about them driving a car on their first date. But that’s what their culture is. I’m not afraid of it. SI.com: What are your rules with your players about social media? 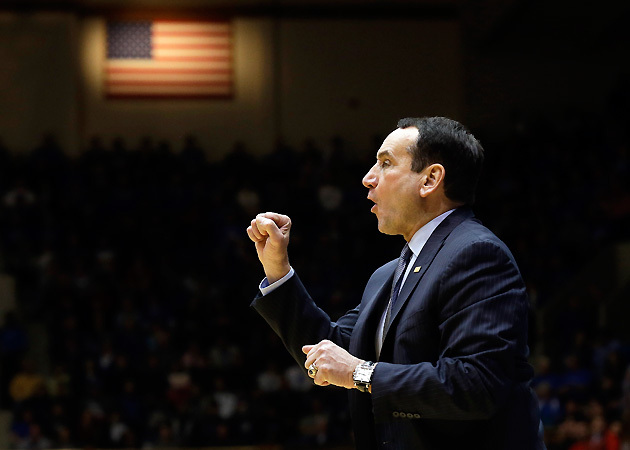 Krzyzewski: Just use common sense and be humble and make sure you understand that when it’s out there, it’s out there. If they make some mistakes doing that, that’s part of their education. We should be able to absorb some mistakes. They just can’t be doing it at halftime or before the game, or when they’re eating together. They’re not allowed to be on their phones during a team meal. And they love one another, so they’re fine with that, but after a game, they all go on their phones. And they should. That’s what they do. It was a tricky figuring out where to rank Florida. Yes, the Gators had a bad week, but they are short-handed. The problem is we don’t know when Dorian Finney-Smith and Eli Carter are coming back. It doesn’t look like it will be in the next few days, so we need to assess the Gators for where they are right now. I’ve been ranking them below my fellow voters thus far, but I don’t think they are really this bad. That analysis is also why I declined to rank Miami, which needed a buzzer beater to win in Gainesville. The Hurricanes are good, though, so I wouldn’t be surprised to see them ranked this week. Utah also lost at San Diego State, but I can’t penalize a team for falling on the road to a team that is ranked ahead of them. Ditto for Michigan State’s loss to Duke, although that one happened on a neutral court. Should I have dinged Kansas more for being embarrassed by Kentucky? Perhaps. But I put the Jayhawks in my top five for a reason, and I just don’t think they’re as bad as they played in that 72-40 loss. They’re young in spots and they have some growing up to do, but they’ll get better. If you’re wondering where I ranked Syracuse last week, the answer is, nowhere. I took a little bit of heat on Twitter for that one, but the Orange showed in losing to Cal by 14 points at home-neutral Madison Square Garden that they are in the early stages of rebuilding. Ditto for SMU, which was ranked No. 22 in last week’s AP poll but did not appear on my ballot. The Mustangs lost at Gonzaga and Indiana, so I’m assuming they won’t be ranked this week. There were no obvious choices to fill out the bottom of my ballot, so as I have often done in the past, I intentionally looked for off-the-beaten-path programs. Call me a sentimentalist. Rhode Island earned its spot by edging Nebraska in overtime at home. And I’m probably a week late in showing Northern Iowa some love. Last week, the Panthers snapped Stephen F. Austin’s 34-game home win streak. It might be a short stay for those guys, but I can live with that. I also looked at possibly ranking Indiana this week, but aside from that SMU game the Hoosiers have played a very weak schedule. They won’t really be challenged again until Dec. 9, when they play Louisville in New York City. Cal had that nice win over Syracuse, but the Bears haven’t played anyone else of note. They do get a visit from Wisconsin on Dec. 22. Should be easy, right?